EIZO is the only company with built-in QC support for Macintosh computers and workstations. In addition to supporting MS Windows OS, EIZO QC software supports OS X Mountain Lion (10.8), OS X Mavericks (10.9) and OS X Yosemite (10.10) will continue to support the Macintosh platform in the future. See the calibration kit information below. EIZO offers the largest selection of manufacturer support video cards. Nvidia, AMD/ATI or Matrox video cards can be ordered with any EIZO diagnostic monitor. Please ask us if you do not see them listed of a particular display. Calibration Kit - Model RadiCS UX1 . American College of Radiology guidelines still recommends the periodic use of a calibration kit to insure that diagnostic integrity is maintained over the life of the monitor. Some states now require the use and documentation of a calibration kit. 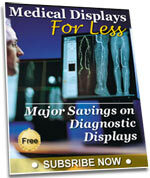 Do not confuse this device with the front sensors on most diagnostic medical displays. They are not the same. 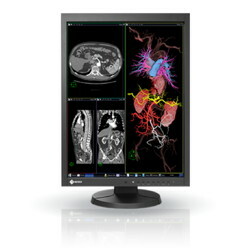 MX-Series 21" 2MP Color TFT LCD LED, DICOM calibration, Black, Integrated Front Sensor(IFS), 1600x1200, Digital & analog inputs, DisplayPort, 420 cd/m2, 1500:1 contrast ratio, 178x178 viewing angles, 6 ms Response Time, RadiCS LE Bundled, Height adjustable pivot stand, UL60601-1, RoHS, 5-year warranty.